Part of what makes superheroes Can You Identify These Superheroes By Their Underwear? Can You Identify These Superheroes By Their Underwear? It's a good thing most superheroes wear their underwear on the outside. Because you'll never know when you'll be asked to identify them by their undies. Read More so awesome is that they can perform impossible feats that we can’t even imagine happening in the world. 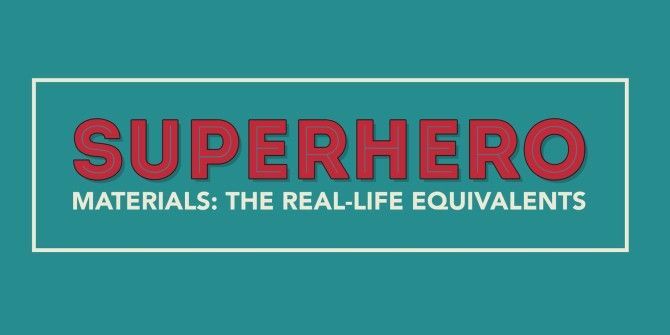 But, what if we could do some of the amazing things superheroes can? What if we could breath underwater The Best Bond Gadgets Of All Time The Best Bond Gadgets Of All Time James Bonds gadgets are legendary. In this article, we run down some of the most futuristic gadgets from the films, and see how they stand up in the era of the iWatch. Read More ? What if we could swing like Spider-Man 10 DIY Props to Make You into a Superhero 10 DIY Props to Make You into a Superhero Like many boys and girls, I spent a bit of time -- probably too much! -- wanting to be a superhero, protecting people from the bad guys and generally saving the day with my awesome... Read More ? As it turns out, the futuristic materials outlined on the infographic below could turn you into the superhero you always wanted to be.